Hindu children all over the world need to learn the basics of the Vedic tradition, so they can understand their religion. One of the Hindu samskaras is Upanayanam. The upanayanam heralds the beginning of a boy's spiritual education. We need a new, gender-neutral ceremony to recognize all our children, both boys and girls, for their efforts to learn their religion. Pujya Swami Dayananda Saraswati has proposed a program called Svikaranam. Svikaranam is conceived of as a graduation ceremony similar to the Jewish bar or bat mitzvah. This program is ideally suited for children between the ages of ten and fifteen years. The student will spend about six weeks to three months learning the chanting of the selected verses from the Upanisads, Mahabharata, Ramayana, Bhagavadgita and some traditional slokas. These verses and mantras were selected by Pujya Swamiji and Swami Tattvavidananda Saraswati. Daily chanting of these can be regarded as nitya karma. 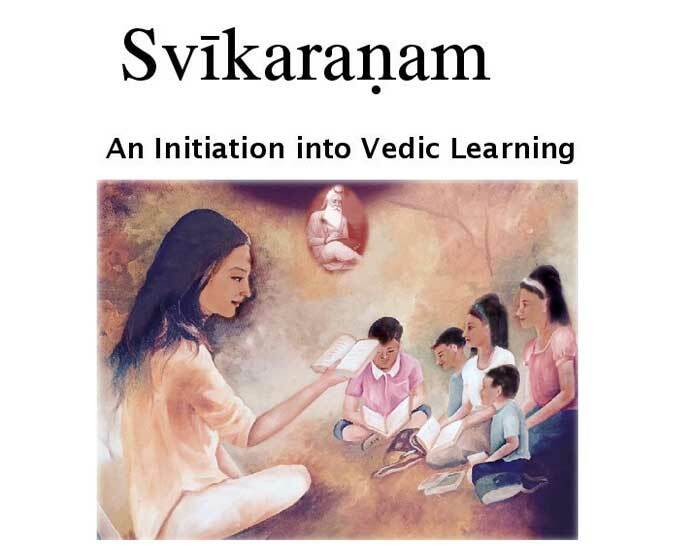 After the student learns to chant all the verses, the Svikaraṇam ceremony should be held. During the ceremony, the student chants all the verses before a gathering of family and friends. This will be followed by the student giving a talk on any one of the ślokas or verses that the student chooses. Then the teacher presents the student with a japamala. More than one student can have the graduation ceremony at the same time. But each student will chant the verses and give the talk by himself or herself. After the ceremony it is recommended that the student chant these verses and shlokas daily as a part of nitya karma.